Oh, the purity of Montserrat Caballé's voice! This purity can be found even her oldest recordings, such as her splendid 1967 Traviata, recorded in Rome under the direction of Georges Prêtre. La Caballé was thirty-two when she released this legendary recording alongside the radiant Carlo Bergonzi and Sherill Milnes (who was just starting out). The softness of her timbre, her commitment to the role, her sustained notes, (the Addio del passato [CD 2 Track 11 if you are listening on Qobuz] without the cuts is exquisite) these are just some of things that made her amazing. With the young Caballé, emotion came from the breath and the simplicity inherited from the bel canto tradition. But her long career contains plenty of other surprises. Born into a very modest and pious family in Barcelona (her Christian name comes from the famous Black Virgin of Montserrat, the patron of Catalonia), she was quickly noticed at the town's Conservatoire, where her talent first began to stun and delight. It was in Basel, where she spent two long seasons as an understudy, that she got her chance, standing in for a colleague who dropped out. The rest, as they say, is history. La Caballé enjoyed success after success and played a huge range of roles. In 1965 her Lucrezia Borgia by Donizetti set New York's Carnegie Hall ablaze, when she had to suddenly replace Marilyn Horne. Thanks to her attention to detail and her exceptional vocal technique, Montserrat Caballé sang on all the great stages of the world, playing princesses and queens with unwavering success. Rossini, Bellini, Donizetti, Spontini, Verdi, Puccini, but also Mozart, Gounod and Massenet were her favourite composers. At the end of her career she even ventured into the Wagner repertoire. When svelte singers at the same age as the characters they played became the fashion, Caballé’s imposing physique could have seen her relegated from the stage; but her vocal presence was more imposing still. Her discographic career is immense and covers her whole repertoire. Her voice began to change in the early 1980s: Montserrat Caballé began to put the emphasis on the dramatic and theatrical side of her performances and diversified her repertoire, no longer hesitating to throw herself into crossovers, for example with Freddie Mercury. She also had a lot of fun on stage, for example at the Festival de Pesaro, where she played a hilarious Madama Cortese in Rossini's Journey to Reims under the direction of Claudio Abbado, a performance which remains famous to this day. Despite poor health that plagued her from childhood, and persistent stage fright which led her to cancel several performances, Montserrat Caballé’s career was one of the finest of the 20th century. Here we hear her perform some little gems such as Turandot under the direction of Zubin Mehta, where she plays an extremely fragile and moving Liù. Of course, Norma, but also Giovanna d'Arco, a largely unknown work by Verdi under the brilliant direction of James Levine. 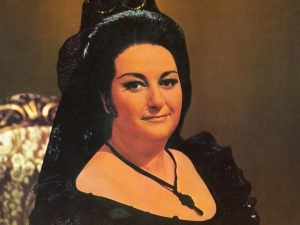 Montserrat Caballé is still without doubt the"Queen of bel canto”.